WHY DIG THE PAST? WHY STUDY OUR HISTORY? To those who wonder WHY DIG THE PAST? We engage in revisiting and revising our past, i.e. historical "revisionism", to unearth hidden truths, develop new emphases and raise new questions on assumptions and explanations for key historical issues and policies --given by our former colonial masters Spain and America, our government officials and authors of history books, then and now. In our homeland's case, we can not afford a "balanced" approach to history since in the past and present years, our homeland's history, more specifically, as it refers to Philippine-US relationships, has been imbalanced in favor of the Americans, who as far as we baby boomers can remember, are only "the good guys" and "do-gooders" in history. It is time for us, especially for native Malay Filipinos-in-the-Philippines to recover our history, a nationalist history, which necessitates uncovering the lies and myths about America; since the American arrival into and 50-year occupation of our homeland, the sweet nothings about "Philippine-American Special Relations", etc. perpetuated through American-sponsored libraries/cultural centers, our school textbooks, mass media, government pronouncements, Filipinos with Americanized minds, etc. We native Filipinos, here and abroad, past and present, relied and continue to use these official explanations that lead only to our ignorance of hidden truths and knowledge of untruths, thus perpetuating the colonial and post-WW2 conditions via neocolonialism aka neoliberalism aka free trade aka WTO-globalization which brought only worsening impoverishment to the native Filipino masses; i.e. foreign control of our national economy, the dwindling of our nonrenewable national patrimony and consequent covert control of our national sovereignty. 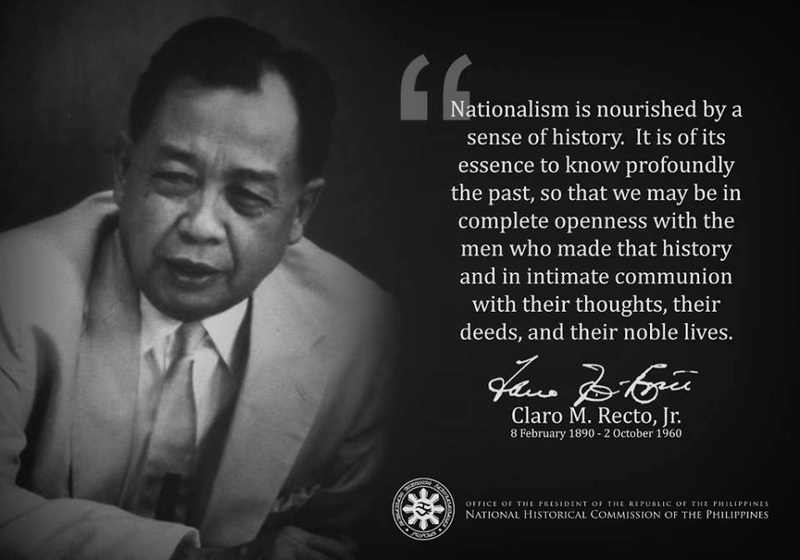 Below is a short essay on the study of our history by our great nationalist, the late Prof. Renato Constantino. History continues to be enriched by new discoveries and new analyses. New truths are unfolded by developing viewpoints that reflect man's changing outlook and goals in each historical stage. There is no source, no matter how biased, that does not yield a bit of historical truth. No attempt at misrepresentation can escape ultimate exposure when a people who make their history critically examine the roles of individuals and groups in particular epochs. It is with this attitude that one should read John Roger Meigs Taylor's "The Philippine Insurrection against the United States: A Compilation of Documents with Notes and Introduction." Like the old chronicles written by Spaniards, Taylor's history is biased in favor of the colonizer but rich in data and revelations essential to a rediscovery and reassessment of Philippine history. The period Taylor covers is still relatively unknown to a majority of Filipinos. What we know contains so many distortions that it has produced attitudes which impede the correct handling of current problems. A thorough study of the past will produce a new consciousness of the present. This new understanding will lead to a clearer view of the future which necessarily involves an alteration and a transformation of the present. It is time, therefore, to accelerate our rediscovery of history in order that we may profit from it. More and more, we are experiencing a tension between our consciousness and the reality of our existence. As a consequence, we have become a people without a sense of history. We accept the present as given, bereft of historicity. Because we have so little comprehension of our past, we have no appreciation of its meaningful interrelation with the present. We lost our history for the first time when the Spaniards, with their fanatical belief in the superiority of their civilization, destroyed the tangible manifestations of our pre-Spanish culture. At a time when we were proving to the world the reality of our nationhood and our capacity for self-rule by ousting a colonial master and resisting the aggression of another, we lost another part of our history. Our records were captured from us. Tons of “insurgent” records were shipped to Washington, there to remain unread for over half a century except by those to whom permission was granted by the U.S. Adjutant General of the Army. Thus this phase of our history is still relatively unexplored. We have fragments of knowledge about this period from the writings of those who have seriously endeavored to elicit the truth from the inadequate materials at hand, but on the whole we are still relatively ignorant of what really happened. This ignorance has been compounded by our acceptance of a version of our history consonant with colonial policy. In 1899 General Otis, Military Governor of the Philippines turned over to me, in Manila, several boxes of original documents which had just been captured from the insurgents and directed me to go over them and select and translate such material therein as would inform the War Department and through it, the Senate of the real character and purposes of the movement against the United States. I carried out these instructions. In 1901 I returned to the United States and was ordered to report to the Adjutant General to act really as a channel of communication between the War Department and certain Senators who were defending on the floor of the Senate, the conduct of the administration with respect to the Philippines. By verbal orders I was assigned to temporary duty in the Insular Bureau. In the Army's view, Taylor's acquaintance with the captured documents of the Revolution made him the person best qualified to defend the military administration in the Philippines. Mounting criticism in the United States of the government's imperialist venture made such a defense imperative. It was therefore as a "quasi-lobbyist" that he was assigned to Washington and it was this assignment that caused him to decide to write “a history of the relations of the United States with the Philippines." His project readily received official approval and the Army extended him all cooperation. All captured documents were loaned by the Army to the Bureau of Insular Affairs where Captain Taylor was detailed indefinitely until he completed his project. Taylor worked conscientiously on the voluminous historical material -- an estimated three tons of records -- and on June 30, 1903 he was able to [xi]report that the documents he had selected for translation and examination were in 2,034 folders. Each folder contained from 1 to 12 documents. He had read and analyzed about 12,204 items. He began his arduous task of translation and annotation in 1902 and completed it in 1906. The first volume contains an introductory narrative with 105 translated exhibits. It begins with an account of the origins of the revolt against Spain and ends with the pact of Biac-na-bato. The second volume continues the narrative for the period 1898 to 1902 describing the relations between Aguinaldo and Dewey and the progress of the war . The remaining three volumes contain 1,430 exhibits. However, when the galley proofs of Taylor's painstaking work were ready, William Howard Taft who was then Secretary of War ordered the publication withheld and, while giving Taylor permission to correct the proof of the documents, he instructed the author to leave the history "for our correction." One wonders what "corrections" of our history he intended to make. Taft who was then running for President limited himself to this curt statement: "One of the things I do not wish to do is to have the matter published before Congress meets, or rather before the election, for I don't care to give it out as an election document." Should the educated Filipinos, who made up the loyal and pro-American faction, have had reason to consider themselves insulted, and should the out-and-out independence party in the Islands have gained an issue out of the publication of a work from the insular bureau, which was anything but complimentary to the quondam insurgents' motives and conduct during the period of revolution, a serious crisis might have followed and one which would have seriously embarrassed the administration. Taylor's history, for all that it reflects the American point of view may indeed have proved controversial at the time. For one thing, it furnished data on the tactics and purposes of those Americans who had been charged with the task of suppressing the Filipino movement for independence. Taft who despite his image as the friend of the Filipinos was in reality a shrewd, far-sighted imperialist might have wanted to "correct" certain parts that exposed too clearly America's real intentions toward the Philippines. For another, Taylor's history uncovered certain unpalatable truths about some leaders of the Philippine Revolution against Spain and the resistance against America. Many of the ilustrado leaders were then already collaborating enthusiastically with the Americans and were being built up by the latter as leaders of the Filipino people under the new dispensation. To one who has had the opportunity to compare the Taylor history with the work of LeRoy which was published in 1914, it is obvious that the invalid (LeRoy) in Fort Bayard Hospital must have been considerably shocked when he read, in December, 1908, something based upon original sources which was so much at variance with what he himself was writing, and which, in turn, was based mainly upon American and Spanish published literature, especially upon reports of government officials, plus his own first hand experience in working with Filipinos. ”Americans in the Philippines”-LeRoy (1914) became an "authoritative" work in Philippine history, whereas Taylor's work remains to this day largely unread. No one knows just how many galley sets were completed. According to Farrell, there is a very well preserved set in the files of the Bureau of Insular Affairs and the Library of Congress has one too. One set went to the headquarters of the Philippine Constabulary, another was sent to the Archives of the Philippines during the administration of Governor Wood, and still another to the library of the University of Michigan. The microfilms of these galleys constitute the basis of this printed work. Although scholars have worked on these microfilms, the tediousness of micro-reading has undoubtedly hampered scholarship. For the first time, scholars can read this work with the convenience of reading printed matters. But these microfilms contain only part of the thousands of original documents known as the Philippine Insurgent Records which were filed in the Archives in Washington until, by a legislative act of July 3, 1957, they were turned over to the Philippines. No one knows how many documents were lost or are unidentifiable for these documents suffered many physical transfers and a great deal of reclassification had to be made. At present they are still in process of classification in the Philippine National Library. The complete set of these records can be found in Microscopy No. 254 of the U. S. National Archives. Taylor's anti-Filipino bias and the circumstances under which his work was undertaken detract from the value of his work. However, his access to the original documents gave him valuable information not open to others. This gave him certain insights into the motivations and behavior of the leaders of the Philippine Revolution which deserve serious study. On the whole, however, this publication of Taylor's “The Philippine Insurrection against the United States" has been undertaken primarily to make available to Philippine scholars a part of the voluminous file of original documents of the Philippine Revolution. It is hoped that similar projects will be undertaken in the near future so that Filipinos may have easy access to that part of their history that has been withheld from them for so many years. Thanks for sharing this brilliant analysis. It is helpful to all students and historians who seek this article.